Satva Yoga Chiang Mai Thailand | Open mind, open heart, balanced body! Open mind, open heart, balanced body! Experience yoga, bodywork therapy, and massage at Satva Yoga Chiang Mai. giving enough understanding, knowledge, creativity, and confidence to develop your own personal practice. After all, yoga is all about freedom! 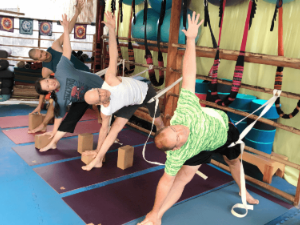 With the use of a unique bamboo wall, inversion slings, ropes, balance ball, blocks,sandbags and bodywork. Students will be taught to work on imbalances in order to correct chronic problems. 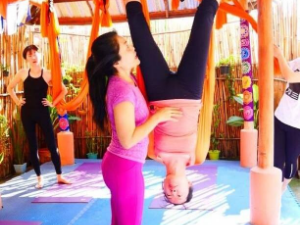 Aerial Yoga is an amazing way to develop core strength, flexibility as well as spinal decompression. Classes at Satva are suitable for beginners, to experienced yogis. Our yoga is alignment based with core movement integration, which is extremely important in order to unwind the patterns that we’ve accumulated over the years. Thus freeing the body and mind. Classes are held outside in our garden studio. Sometimes our dog Happy joins the class too! You can get positive energy and healthy mind. Enjoy at Satva. Great place, friendly people! Amazing teachers! Had so much fun with the yoga teacher. Very friendly person. Will come again for sure! Ready to join the Satva family? “One of my favourite yoga studios in Chiang Mai is Satva Yoga. Satva’s daily morning Iyengar classes help you work on your alignment and teach you how to perfect each asana with the help of props. An excellent class for beginners and intermediate yogis + yoginis alike.